who think off the shelve. Carrot specialist at heart. Great in the growth and processing of organic carrots. Delivering the whole year round the best carrots, cauliflower, kohlrabi and broccoli, that is what our cultivation colleagues do day in and day out. From small seed, to the supermarket shelves. 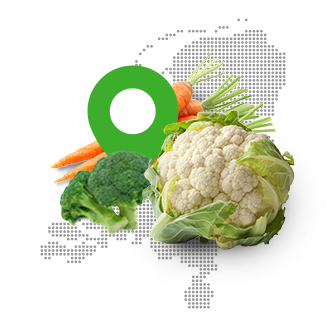 Polderfresh cultivates, processes and trades, top quality field vegetables. We are great in organic carrots. In the Noordoostpolder area, we cultivate, together with regional fellow-cultivators, carrots in all shapes and sizes – mainly organic – for the retails, but also the wholesale and processing industry. In our production facility, the carrots are washed, polished, sorted, and packaged in any desired size and then delivered by our transport colleagues to the customer. We also cultivate cauliflower and broccoli in several varieties. From the field, straight to our customers. In the fertile soil of Andalusia, our Spanish colleagues grow on an acreage of 500 hectares, field vegetables of the best quality. From November to April, we grow several varieties of broccoli, cauliflower, kohlrabi and carrot. But we are not only growers, we also arrange the entire packaging and shipment process ourselves. Our products will find their way to European buyers in retail, the processing industry, and in the end, the consumer. Cultivation and processing of your products is completely customised. Together with you, we will sit down and discuss and map the range, the packaging and other specifications. We also work with the best seed breeders and partners in the chain. And we all have one goal: to align the varieties that we grow with your requirements. But there is more. Because we are in full charge of the entire chain, from cultivation to shelf, you are ensured of an extremely fresh product. Each year, a large volume of vegetables is cultivated, harvested, processed, stored, traded, and distributed by our transport colleagues, this way. It cannot get any fresher than this. 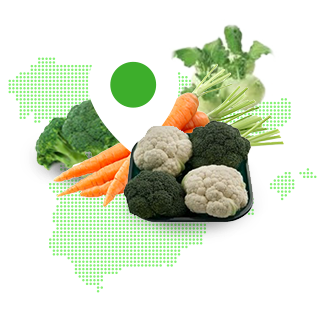 All year round, we deliver large volumes of field vegetables of constant quality. Besides our own cultivation, we also collaborate with selected growers who we support with intensive cultivation support. Products are chilled in our cold storage immediately after harvest and stay in conditioned areas until they reach the shelves. With our cultivation locations in Noordoostpolder in the Netherlands and in Spain, and our connections in the chain, we succeed to meet your demand throughout the year. Whether it involves a pallet per month, or a daily delivery, we always have the desired quantity you need. It is very likely that the organic carrots you find in the shops, comes from us. Because carrots are the biggest specialty at cultivation and processing company Polderfresh. Conventional, but especially organic. Besides our own cultivation, we work closely together with a group of steady contract growers of which we know they are experts in organic cultivation. From the first tillage to the harvest and later the processing, quality is securely checked by our specialists. For the processing of our organic products, we have a separate rinsing, sorting and packaging line with matching washing water facility. This way, there will be no cross-contamination with conventional products. Because with us, organic is truly organic. Naturally. With three product lines for tray packaging. Polderfresh is the biggest in small packaging. Vegetables such as cauliflower, broccoli and carrots, are not only healthy, they are also versatile vegetables that you can cook, steam, stir-fry, wok, or simply eat raw. It is no surprise then, that we increasingly see these products used in, for example, vegetarian products or in low-carb dishes. We not only deliver single vegetables, but you can also count on us for convenience solutions such as cauliflower florets, carrot pasta and more of these types of easy purposes. In collaboration with growers and buyers, we arrange for quality products, exactly on time and in the correct amount and the desired sorting. Want to grow something fantastic together? We are located in Maasdijk, Espel (the Netherlands) and in Spain. You are always welcome! Would you like to know more about our cultivation solutions? Then please contact Maarten Feenstra. Want to know more about our processing possibilities? Then please call Sjaak Fatels.